Lol, give it to Dencia, she goes all out! 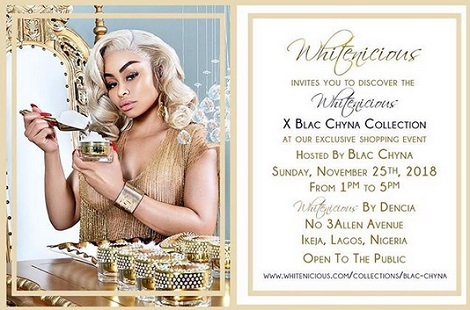 So Blac Chyna will be in Nigeria this coming sunday, 25th November, 2018 for the launch of “Whitenicious X Blac Chyna Diamond Illuminating & Lightening Cream”. According to gist, the cream goes for $250 dollars per jar which is about N90,750. We are told it's a partnership. Recall, Chyna last month tweeted she was coming to Nigeria? Well, she has made another statement on her IG inviting all to meet her this Sunday at whitenicious store in Lagos.